Panier is the first object to be created by Ronan and Erwan Bouroullec for Kartell. Rigorous technological and functional research resulted in a container basket in a simple but very communicative shape. This is compromised of four modules that form the four dividers of a shiny, transparent circle bursting into rays of light. The fourths are attached to each other using opaque joints, and stability is achieved simply by using inserts. Panier is a container which can be closed on one side with a transparent lid in polycarbonate and can easily be used as an end table or as a magazine rack. 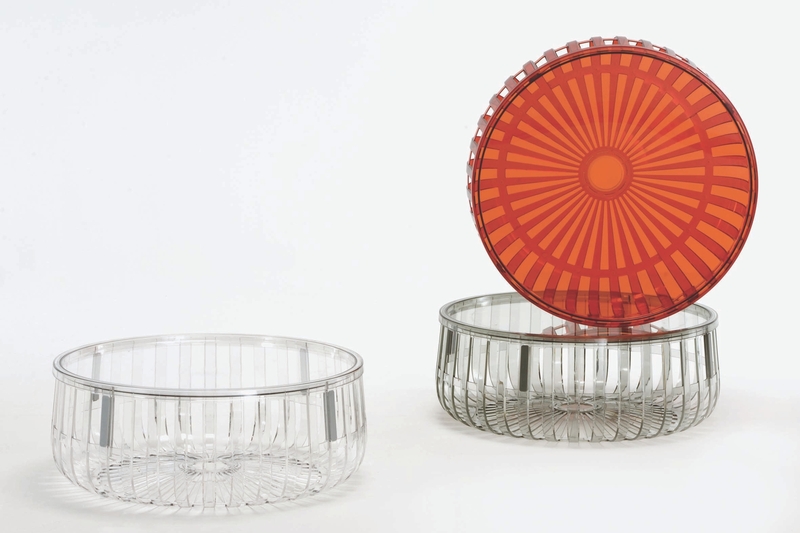 Panier is made of transparent polycarbonate and is available in a variety of colours. Itâ€™s a practical and eclectic object with an attractive and playful experience.